Definition at line 41 of file llgenepool.h. Definition at line 46 of file llgenepool.cpp. Definition at line 52 of file llgenepool.cpp. 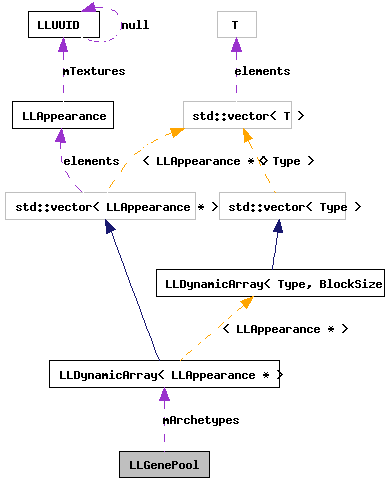 References LLDynamicArray< Type, BlockSize >::count(), i, mArchetypes, and S32. Definition at line 61 of file llgenepool.cpp. References LLXmlTree::addAttributeString(), FALSE, gDirUtilp, LLXmlTreeNode::getChildByName(), LLDir::getExpandedFilename(), LLXmlTreeNode::getFastAttributeString(), LLXmlTreeNode::getNextNamedChild(), LLXmlTree::getRoot(), LLXmlTreeNode::hasName(), LL_PATH_CHARACTER, llendl, llwarns, loadNodeArchetype(), mLoaded, LLXmlTree::parseFile(), and TRUE. Definition at line 123 of file llgenepool.cpp. References LLXmlTree::addAttributeString(), FALSE, gAgent, LLAgent::getAvatarObject(), LLXmlTreeNode::getChildByName(), LLXmlTreeNode::getFastAttributeF32(), LLXmlTreeNode::getFastAttributeS32(), LLXmlTreeNode::getFastAttributeUUID(), LLXmlTreeNode::getNextNamedChild(), LLCharacter::getVisualParam(), LLXmlTreeNode::hasName(), llassert, llendl, llwarns, mArchetypes, param, LLDynamicArray< Type, BlockSize >::put(), S32, and TRUE. Definition at line 207 of file llgenepool.cpp. References LLDynamicArray< Type, BlockSize >::count(), f, gAgent, LLAgent::getAvatarObject(), LLVOAvatar::getDefaultTEImageID(), LLCharacter::getFirstVisualParam(), LLVisualParam::getID(), LLViewerImageList::getImage(), LLCharacter::getNextVisualParam(), LLAppearance::getParam(), LLVOAvatar::getTEWearableType(), LLAppearance::getTexture(), LLCharacter::getVisualParam(), LLVisualParam::getWeight(), gImageList, i, LLVOAvatar::isTextureIndexBaked(), j, llendl, llwarns, load(), mArchetypes, mLoaded, NULL, param, S32, LLAgent::sendAgentSetAppearance(), LLVOAvatar::setLocTexTE(), LLVOAvatar::startAppearanceAnimation(), LLVOAvatar::TEX_NUM_ENTRIES, TRUE, LLVOAvatar::updateMeshTextures(), LLVOAvatar::updateVisualParams(), and VISUAL_PARAM_GROUP_TWEAKABLE. Definition at line 55 of file llgenepool.h. Referenced by loadNodeArchetype(), spawn(), and ~LLGenePool(). Definition at line 54 of file llgenepool.h. Referenced by load(), and spawn().